I simply adore my vegan cookbook Chloe’s Kitchen by Chloe Coscarelli. There are so many scrumptious recipes and classic favorites all with a vegan flare to them. This morning (well early afternoon actually) I woke up craving pancakes. I am fed up with the bland flavor of premixed pancake batter and decided making pancakes from scratch was the way to go. I have normally avoided making pancakes from scratch since it seemed like such a tedious process. However, Chef Chloe makes it superbly easy and delicious. 1. In a large bowl, whisk together flour, baking powder, salt, and cinnamon (and nutmeg!). In a separate small bowl, whisk together water and maple syrup. Add the liquid to the flour mixture and whisk until just combined. Do not overmix; the batter should have some lumps. 2. Lightly oil a large nonstick skillet or griddle and heat over medium-high heat. For each pancake, pour 1/4 cup of batter onto the skillet and sprinkle blueberries on top (or raspberries), if using. When small bubbles appear in the center of the pancake, it is time to flip it. Let it cook on the other side until lightly browned and cooked through, about 1 more minute. Repeat with remaining batter, adding more oil to the skillet as needed. If the batter gets too thick, add a little more water, 1 tablespoon at a time. If you need to make pancakes for more people just double the quantities in this recipe! 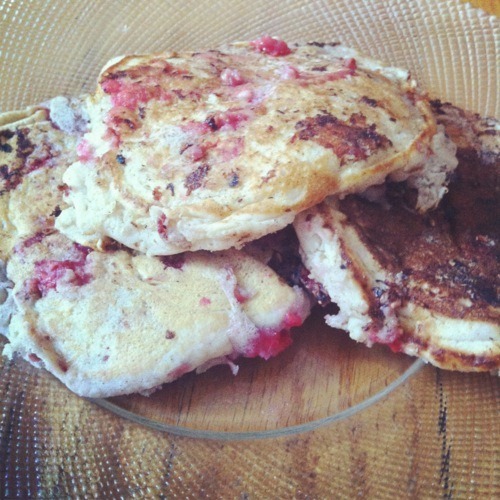 Here are what my pancakes turned out like. They were delicious but a little messy as you can tell. I don’t ever want to use Aunt Jemima or whatever other brand premade mix for pancakes. I will be making my pancakes from scratch from now on! Thank you Chef Chloe!